3) Servo Wire Splitter (Y-harness). Note: If you have a 5 or more Channel Radio, all you need are items 1 and 2, but if you have only a 4 Channel Radio (like what comes with the Bixler V1.1), then you will also need this item. In the case of using your bomb drop on a 4-channel radio, the splitter will be used to send the rudder signal to both your rudder servo, as well as your bomb drop servo. That way, you activate your bomb drop by moving the rudder. This is ok since you don't need to use the rudder much during flight anyway, but it's still available if you need it, once you drop your bomb. Note: If any links in this document are broken, please notify me by commenting below this article. All questions or comments are welcome. (Update 6 Oct. 2013): My #1 Choice is now the HobbyKing Bixler 2 RTF, as it just came out in a Ready-To-Fly version within the past couple months. Also, after having flown the Dynam Hawk Sky again recently, I regretfully must say that its power is nothing compared to the Bixler V1.1 or 2, so I must recommend the Bixler far above the Hawk Sky at this point, though the Hawk Sky is still a good choice. The Bixler V1.1, for example, has so much power that a skilled pilot can easily do belly-TAKEOFFS on grass, simply by sliding along its belly until it has enough airspeed to lift off. The Hawk Sky, on the other hand, had such a dramatically lower amount of power when I flew it that it couldn't even budge when given full throttle sitting on the grass. Overall, I haven't ever seen a better, more economical and functional, Ready-to-Fly trainer than the HobbyKing Bixler 2 RTF. -Note: if you want more SPEED, buy the Bixler V1.1 RTF instead, as it uses a higher-Kv motor and smaller prop. If you want more THRUST AND EFFICIENCY (longer flight time), buy the Bixler V2 RTF, as it has a lower-Kv motor and larger prop. Also, the Bixler V2 RTF comes with a better Transmitter, since it is 6-channels instead of only 4. There are a thousand different opinions out there about which "beginner airplane" is the best. The truth is, there is no one single answer. There is no such thing as "the best" beginner airplane. However, this is an attempt to characterize a beginner airplane and explain what kinds of things need to be considered, and what parts/equipment may be desired. Many links are provided to help the absolute novice think about what they might want, and see some of the more intricate parts required for a more enjoyable & successful RC experience. What makes a good beginner plane? 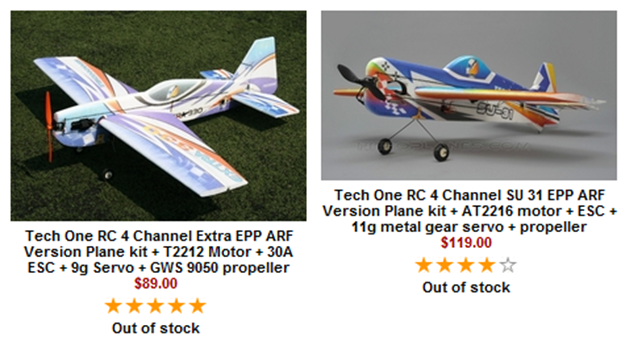 · inexpensive: ≤ $100~$200 for a plane with *all* necessary electronics, including brushless motor, propeller, Electronic Speed Controller (ESC), LiPo battery, cheap balancing charger, and Radio Transmitter (Tx) and Receiver (Rx) all in one box! · In other words, look for an RTF (“Ready to Fly”) plane. Nope, sorry, it doesn’t actually come ready to fly, but it should come with all of those electronics just mentioned above (read its description carefully though to make sure it actually does) and it can be put together in only 1-3 hrs. · easy to put together. 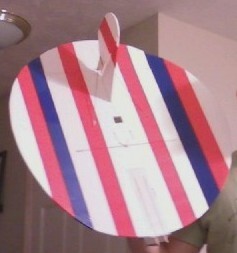 Can be ready to fly in just a couple hrs. · 4-channel control (not just 3-channel). Has throttle, rudder, elevator, *and* ailerons. · natural roll stability due to a main wing with dihedral (V-shaped wing when viewed from the front) or polyhedral (tips curved up, acting like a dihedral wing). See page 4 for pictures. Both of these main wing types will cause the plane to naturally right itself/roll level if banked. · flat-bottomed airfoil (provides the best lift possible, with gentle stall characteristics, excellent glide ratio, and the ability to fly very slowly). Do NOT get a plane with a symmetric airfoil (curved on the top and bottom of main wing when viewed from the side)—this plane will be aerobatic and not able to fly as slowly. 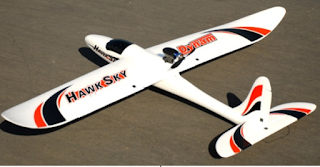 1) Dynam Hawk Sky, 4 Ch powered glider, $110 http://www.nitroplanes.com/60a-dy8925-hawksky-rtf-24g.html OR HobbyKing Bixler v1.1 RTF [“Ready to Fly”], *Mode 2* powered glider, $103 http://www.hobbyking.com/hobbyking/store/uh_viewitem.asp?idproduct=16542&aff=281904 (personally, I recommend the Bixler v1.1 more, though both are great planes). Note: the Bixlerv1.1 has many improved features over the original Bixler. 2) Charger -- if you want an upgraded charger, I'd highly recommend the ones in 2.a. below. However, if you want to go the economical route, just use the included basic charger that comes with the Bixler v1.1 or Dynam Hawk Sky. If you buy the Bixler v1.1 (my prefered choice), however, you'll need to also separately purchase the power supply for it below in 2.b. a. Good universal charger, Thunder AC6 or AC680, $45~$60 with shipping . I’d recommend the AC680 more. Read my "how-to" post here to learn how to install and use the computer data-logging software that is compatible with these chargers: Thunder AC680/AC6 Charger & Computer Data-logging Software. Find these chargers here: http://www.xheli.com/thunder.html. They are also available from the same company at one of their alternate websites here: http://www.nitroplanes.com/thch.html, here: http://www.hobbypartz.com/thunder.html, or here: http://www.nitrorcx.com/thch.html. If I am not mistaken, hobbypartz.com will have cheaper shipping than the others. If these chargers are completely out of stock, or if you’d like some other options, or even just want to know more about chargers, let me know by commenting below this document and I’ll answer your questions, explain more about chargers and/or point you to a good alternative. “Thunder AC6 Battery Charger Basics” informational video here: http://www.youtube.com/watch?v=4zvwAZc3Gpc&feature=related. You may also check out HobbyKing’s entire line of chargers here: http://www.hobbyking.com/hobbyking/store/__216__408__Chargers_Accessories-Battery_Chargers.html. Please note, however, that most chargers do *not* come with an included power supply, so you’ll need to buy one separately in most cases. Look out for that. The AC6 or AC680 above are both exceptions to this rule, as they come with built-in AC/DC power supplies. b. Bixler v1.1 AC/DC Power Supply: 12V 1.5A or more, 5.5 x 2.1mm plug (positive on the inside), $6: http://www.ebay.com/itm/AC-100V-240V-Converter-Adapter-DC-12V-1-5A-Power-Supply-US-5-5mm-x-2-1mm-1500mA-/221172448393?pt=US_Server_Power_Supplies&hash=item337ee7bc89. Though (last I checked) the Dynam Hawk Sky’s included basic charger does come with a power supply, the HobbyKing Bixler v1.1 RTF’s included basic charger (similar to this one: http://www.hobbyking.com/hobbyking/store/uh_viewitem.asp?idproduct=7637&aff=281904) does *not* have an included power supply. 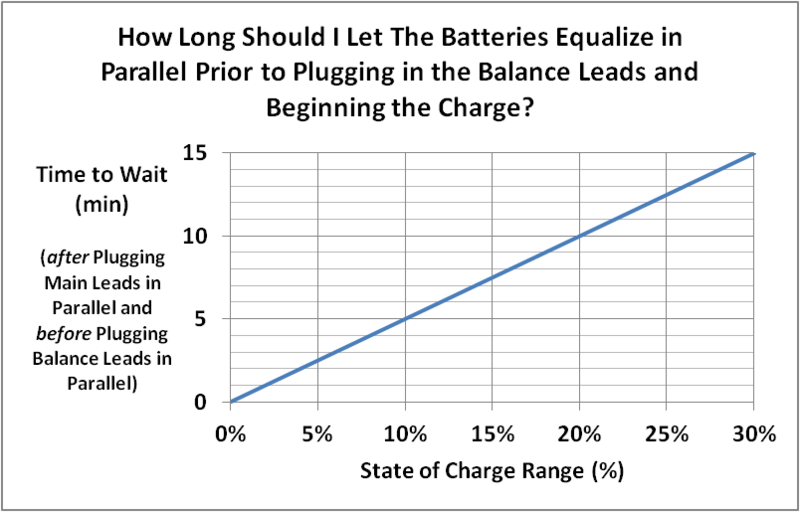 Therefore, they expect you to use your car’s 12V battery or a separate power supply, such as the one above. If the one above on ebay is sold out, search around to find an alternate that has those specifications above. 4) Spare batteries (get 1~3 or more of these): Turnigy 1800 mah 3S 20C LiPo, $10 each: http://www.hobbyking.com/hobbyking/store/uh_viewitem.asp?idproduct=9274&aff=281904, OR Turnigy2200mAh 3S 20C, $8 each: http://www.hobbyking.com/hobbyking/store/uh_viewitem.asp?idproduct=8932&aff=281904. (Note: either of the two batteries above should get you ~20 minutes of flight time). 5) Adhesive Velcro, $2.50~$5.00 (get 1 or 2 meters of it): http://www.hobbyking.com/hobbyking/store/uh_viewitem.asp?idproduct=9374&aff=281904. <--Despite its super low price, this is the BEST adhesive Velcro I have *ever* used! It is extremely useful for securing your batteries to your plane, or even electronics, speed controllers, receivers, etc. It can even be used for securing a removable home-made “bomb” drop to your plane (see http://electricrcaircraftguy.blogspot.com/2013/01/bonus-bomb-drop.html for ideas on making a bomb drop). This Velcro is stronger and stickier than anything I’ve seen in stores, and still sticks well in cold weather. I’ve been flying all winter long and my buddy’s Velcro he bought for $15 or so locally was literally falling off of his plane in the 30°F snowy weather, while my $2.50 HobbyKing Velcro held on like a champ! I gave him some of mine and he was impressed. 6) ***Dual temperature*** Hot Glue gun and glue, ~$15 (with glue sticks) from Walmart. “Dual temperature” means that the glue gun MUST have dual heat settings, high/low so that you can use low setting when you need to and not melt the foam plane, yet you still have high to help it heat up faster and get more sticky on surfaces that can handle a little more heat (hotter = more sticky). You can also buy a good one of these glue guns from Amazon here: http://www.amazon.com/Adhesive-Technologies-0443-Two-Temp-Cordless/dp/B001689XCQ <-- Note: I own this exact glue gun and it works well. It works fantastic for RC planes and has a nice, precision tip and hasn’t broken on me with regular use in the past 4 years I’ve had it. If the glue ever gets jammed (has happened a few times after being on high heat for very long periods of time), pull the glue stick out, pull off the melted portion that may be getting stuck in the gun, re-insert glue stick, and continue use. I use the “high” heat setting to heat it up quickly, then I switch to “low” once it’s hot so I don’t melt the foam. So far that I have found, the quality can’t be beat for its price, though better dual temperature glue guns do exist. 7) Clear Packing Tape at Walmart or wherever else you choose to buy it. – good for repairs where the full stickiness and strength of strapping tape is not needed. 8) Scotch strapping tape at Walmart or wherever else you choose (strapping tape has fiberglass strands running down it), or on Amazon here (10 yards for $4.42) or here (30 yards for $7.83) < – use this tape to increase wing strength by running a single strip of it down the full length of the wings on the top and bottom. Also, I highly recommend taping the wings on or they may fall off during flight (I’ve seen it happen while the plane was over 100 ft. high; luckily these planes are made out of super durable EPO foam and the repair was <1 hr.). 9) 5 or 6 min. Epoxy “glue”, $6 (optional; other type of glue are out there, and for foam planes I prefer hot glue or Goop/Shoe Goo/E-6000 over epoxy, though epoxy is good). http://www.hobbyking.com/hobbyking/store/uh_viewitem.asp?idproduct=8684&aff=281904 or http://www3.towerhobbies.com/cgi-bin/wti0001p?&I=LXPT44&P=ML. 11) Goop/Shoe Goo/E-6000 (manufacturer’s website here: http://eclecticproducts.com/retail_products.htm), ~$5, available just about anywhere, including Lowes, Home Depot, Walmart, etc. All three of these adhesives are very similar, and work *excellent* on EPO or EPP foam, on areas where more strength is needed than what hot glue can provide. These glues are very strong. Beware, however, that they do “melt” or dissolve polystyrenes such as EPS (Expanded Polystyrene, ie: “Styrofoam”) and Depron (which is Extruded Polystyrene). 12) Extra Servo or two, 9 g, $3 each, (in case one that comes with the Bixler v1.1 or Hawk Sky breaks) http://www.hobbyking.com/hobbyking/store/uh_viewitem.asp?idproduct=662&aff=281904. Note: 1 of these servos can also be used to make a bomb drop! –see here: http://electricrcaircraftguy.blogspot.com/2013/01/bonus-bomb-drop.html. 13) A nice Transmitter (AKA “Tx,” or Radio) battery pack, $7: http://www.hobbyking.com/hobbyking/store/uh_viewitem.asp?idproduct=17955&aff=281904 Although this LiFe [Lithium-Iron] battery pack is the best choice when it fits inside your transmitter, it doesn't fit into the transmitter that comes with the Bixler v1.1 RTF airplane. However, it should fit into the Dynam transmitter, but may require a slight plug modification. If you'd like to use AA cells instead [or for the Bixler v1.1, 8 AA-sized batteries are mandatory], you may buy 8 AA-sized rechargeable Rayovak NiMh batteries, ~$12 or so at Walmart or on Amazon or wherever, or you may even use nonrechargeable Alkaline AA batteries. 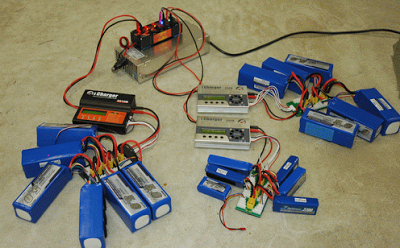 You could also buy 8 NiMH batteries from HobbyKing here or here. Note: again, the LiFe battery pack above will NOT work with the Bixler v1.1 RTF transmitter, so you'll have to use AA batteries in this case instead. Whether you get the LiFe Tx battery pack above, or use 8 AA NiMh batteries, use the nice charger in item 2a to charge these batteries. 14) Battery charger adapters, Male/Female XT60, $3 per pack of 5. http://www.hobbyking.com/hobbyking/store/uh_viewitem.asp?idproduct=9572&aff=281904. Note: if you use the charger in item 2a, you can’t charge your batteries without this. If you ever buy other batteries in the future from other websites, or locally, you’ll also likely need these to change over the plugs on those future batteries, so that they are compatible with your plane, so I’d recommend getting 2 packs of these. Personally, I love the XT60 connectors and the HobbyKing version of the JST connectors (other versions of the JST connector are lower quality), so I change over all of my battery connectors by soldering on either these (for high-amp applications, 15~60A) or the JST connectors below (for low-amp applications, approximately 3~18A). 16) JST connectors (male). Again, depending on what connector comes you’re your Hawk Sky, you may need these connectors for your battery/charger adapters instead. 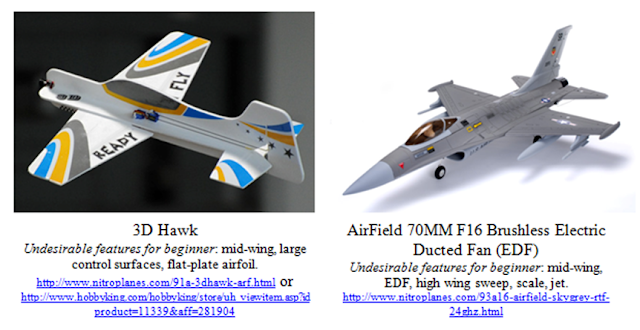 Regardless, you will find they come in handy for future planes: http://www.hobbyking.com/hobbyking/store/uh_viewitem.asp?idproduct=9682&aff=281904. 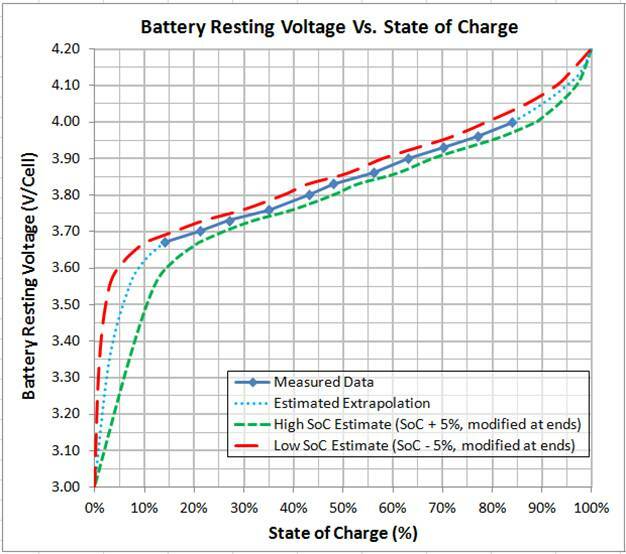 -WARNING: YOU MUST KNOW HOW TO DO LIPO BATTERY PARALLEL CHARGING PROPERLY OR YOU MAY CAUSE BATTERY DAMAGE AND OR FIRES, so for more info read my parallel charging article here. 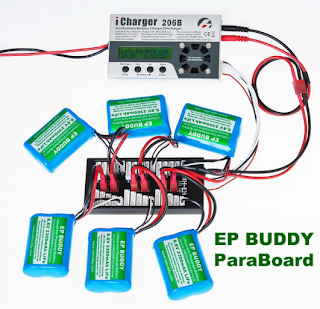 19) Parallel JST adapters (to plug into parallel charge board, depending on which connector your batteries use), get 6 of these, $1.50 each: http://www.hobbyking.com/hobbyking/store/uh_viewitem.asp?idproduct=18868&aff=281904 OR solder your own together using the XT60 connectors and female JST connectors and the below soldering kit, OR just buy this to use for the main leads in parallel charging (this is my most recommended option): http://www.hobbyking.com/hobbyking/store/uh_viewitem.asp?idproduct=14852&aff=281904. 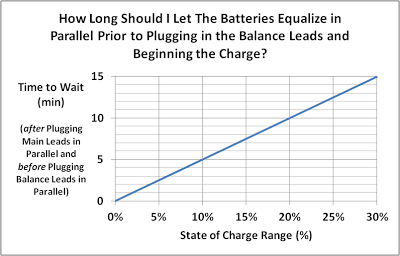 20) Battery Voltage Checker (highly recommended) – allows you to easily see if your batteries are properly charged or not. Some even can be flown on your airplane in order to loudly beep when it’s time to land. I’d recommend this one (with programmable beeping alarm, to be used in flight): http://www.hobbyking.com/hobbyking/store/uh_viewitem.asp?idproduct=18588&aff=281904 AND 1 of the following--either this one: http://www.hobbyking.com/hobbyking/store/uh_viewitem.asp?idproduct=10952&aff=281904 ($14), this one: http://www.hobbyking.com/hobbyking/store/uh_viewitem.asp?idproduct=19946&aff=281904 ($8), OR this one: http://www.hobbyking.com/hobbyking/store/uh_viewitem.asp?idproduct=15941&aff=281904 ($43). 1) Excellent quality, Windows 7-compatible, inexpensive flight simulator--Aerofly EasyFly4 by Ikarus: http://shop.ikarus-usa.com/easyfly-4/easyfly4-starter-edition-with-game-commander/, $40 with RC game controller!! 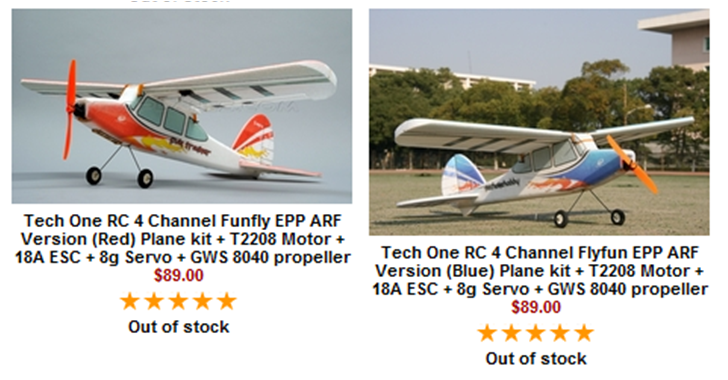 !...OR, go all out and purchase the full version of Aerofly 5 for up to $300: http://shop.ikarus-usa.com/aerofly-5/. (I’d go with the $40 version above). For a review of the Ikarus flight simulators, check out this video review here by one of my favorite RC aficionados, "NightFlyyer." 2) Note: if you want other options, in my opinion, the Ikarus Aerfly simulator and the Great Planes RealFlight simulators are the two best RC flight simulators in the industry. 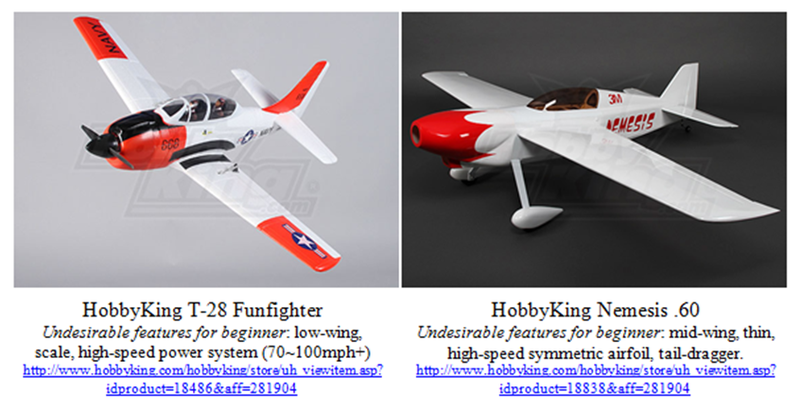 So, if you want to check out the RealFlight option, here is their website: http://www.realflight.com/, here is where you can buy their $200 full version: http://www3.towerhobbies.com/cgi-bin/wti0001p?&I=LXCREN&P=ML, and here is where you can buy their $100 basic version (unlike the $40 Ikarus version, this is the cheapest version of RealFlight available): http://www3.towerhobbies.com/cgi-bin/wti0001p?&I=LXXSG5&P=ML. 3) Feel free to experiment with other, very inexpensive, RC simulators, as even the free or extremely cheap ones are quite useful, so long as you can use a USB-type hand-held transmitter similar to a real RC transmitter. 21) Soldering Iron, 60W, $8: http://www3.towerhobbies.com/cgi-bin/wti0001p?&I=LXPR36&P=ML. I recommend that you do NOT get a 30W iron—it’s not hot enough for soldering larger wires and connectors (ex: 8~10 gauge wires) which you may eventually need on future planes, and a 60W iron makes it much easier to solder hardware, such as pushrods and clevises, when necessary. Having the extra heat of a 60W iron over a 30W iron also makes soldering nearly any wire in general easier, as the heat can be applied over a shorter period of time (which is better for heat-sensitive electronics, as they will not heat up as much as they would from a 30W iron applying heat over a longer time), and the solder wicks into the wires faster. I use my 60W iron on all RC wires and hardware I solder, even down to as small as 30 gauge wire. If you plan on soldering very intricate parts or circuit boards, however, that is when you’d want the smaller tip and lower power of a 30W iron. 23) Solder tip cleaner (tiny circular tin can at Radio Shack, item #64-020)—optional—necessary only if you have difficulty tinning the soldering iron tip, ~$8 maybe. 24) Soldering stand (optional, since the soldering iron [item 21 above] comes with a cheap little stand)—buy at local Radio Shack, item #64-2078, $10 (seehttp://www.radioshack.com/product/index.jsp?productId=2062740) OR at HobbyKing for $3: http://www.hobbyking.com/hobbyking/store/uh_viewitem.asp?idproduct=21262&aff=281904. 25) Multipack of heat shrink tubing, Radio Shack ~$8 maybe, OR at Harbor Freight Tools for a few dollars, OR even better yet, get an assortment (red and black for each size) of 2, 3, 4, 5, and 6 mm heat shrink tubing here: http://www.hobbyking.com/hobbyking/store/__375__58__Hardware_accessories_-Shrink_Tube.html. 27) Helping Hands, $3-$5 at Harbor Freight Tools – VERY HANDY for soldering wires and connectors without a second person’s help. Get at *least* 1 of these, but I prefer to have two: http://www.harborfreight.com/helping-hands-319.html. Note: if you don’t have a local Harbor Freight Tools store, you can buy a similar item from HobbyKing instead (http://www.hobbyking.com/hobbyking/store/uh_viewitem.asp?idproduct=10615&aff=281904), but after shipping costs you’d be better off just going to Harbor Freight if possible. b. HobbyKing 160W Dremel-Style Rotary hand-tool—for only $15, and having good reviews, you can’t go wrong! Though I don’t own one of these, had I known about it before buying myDremel, I’m sure I would have tried one of these out instead: http://www.hobbyking.com/hobbyking/store/uh_viewitem.asp?idproduct=10489&aff=281904. -Note: to balance a prop, you'll need some medium-viscosity Super Glue (ie: CA, or cyanoacrylate) to add weight to the light prop blade, some sand-paper (220~280 grit or so) to lighten a prop blade and/or smooth added CA resin, and some "CA accelerator" to get the CA to cure almost instantly. Here are links to those items, except for the sand paper, which you can buy from your local hardware store: HobbyKing medium CA ($3), 2 oz. accelerator in pump spray bottle ($4), 8 oz. accelerator refill ($8). Get Local Help From an RC Aircraft Club Near You! · The Academy of Model Aeronautics (AMA) is the “Official national body for model aviation in the United States.” AMA-chartered clubs are a valuable resource to get started in this hobby, and often-times local clubs have people available who can help you learn to fly by attaching two radios together in a system known as a “buddy box,” or “trainer system.” Find a local club through the AMA’s website here: http://www.modelaircraft.org/ --> click on “Members & Clubs” (at the top) --> “Club Services” --> “Find a Club.” You may also click here (http://www.modelaircraft.org/membership/clubs.aspx) and follow the link. I’d have to say that this Tuff Trainer is also an *excellent* and economical choice for a beginner. Though it is a tail-dragger (which is undesirable), it makes up for that by having a “prop-saver,” which protects the propeller in the (very likely) event of a nose-over. (A prop-saver is device that allows the propeller to be attached using a rubber O-ring, so that it flexes/bends back in the event of a nose-over or crash, and prevents the prop from breaking). This plane is also made of very tough EPP foam, should be easily repaired using a hot glue gun and strapping tape, and is 4-channels, so it has aileron control! 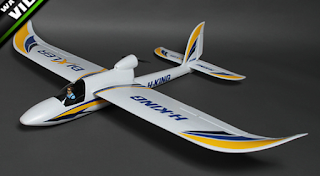 -Now that you know what features to look for in a beginner plane, here is another good list of good tough, durable, EPP foam planes to look at. 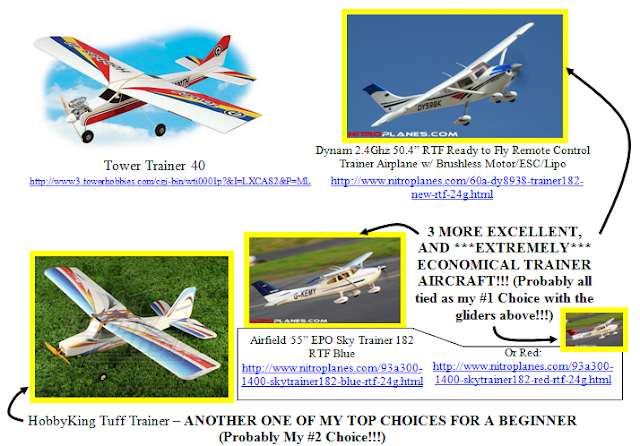 Try to choose the best plane for your skill level, OR choose one of the beginner planes I have previously recommended. (Again, for a beginner, choose a high-wing “trainer” type plane with the beginner features previously described in this document, or perhaps one of the flying wings. For a more advanced pilot, you might try one of the super aerobatic, mid-wing “3D” designs. Note: “3D” means that the aircraft is extremely aerobatic and capable of hovering or otherwise flying below the stall speed of the main wing by “hanging” on the propeller—to do this the airplane must have a thrust greater than its weight, as well as very large control surfaces to control the plane in low-speed, stalled flight).